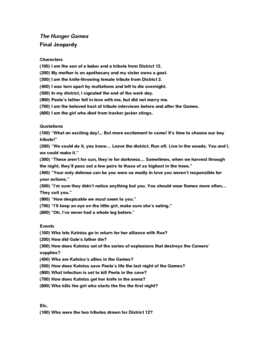 This is a review game for the novel, The Hunger Games, by Suzanne Collins. It covers all 27 chapters of the book and is ideal to use prior to your summative assessment. I always use jeopardy games to review for tests, allowing students to take as many notes as they want. This jeopardy game includes answers on the reverse side for the teacher. This is a very easily-modified product! Each category has 8 questions with point values ranging from 100 to 800 points. The questions have more points as they become more difficult. The categories are: characters, quotations, events, and etc. This is a great way to get your class excited about studying!